While you usually come here to see my articles about MTG Finance, Corbin suggested I take the week off to talk about playing in Grand Prix Pittsburgh. While I didn’t end up getting a Pro Tour invite from this past weekend, I did learn a lot about using your time wisely in a tournament. And everyone knows time is money. 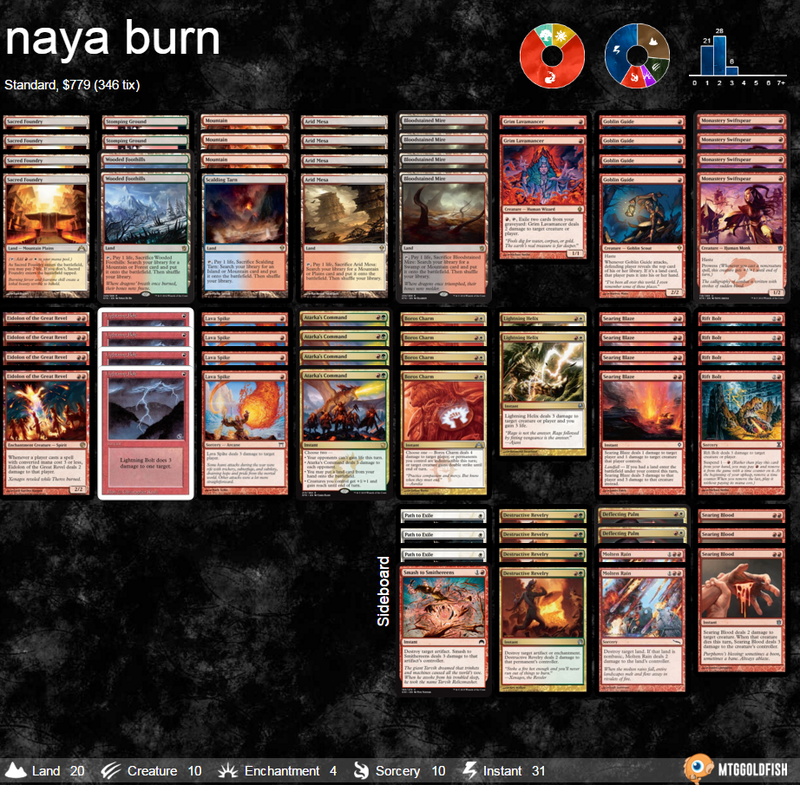 I played Naya Burn and for a very good reason. My mental and physical fortitude was going to be tested in 15 or more rounds of Magic. If you are not an expert Modern player, it’s hard to recommend any deck that is likely to go to time in the round throughout the tournament. Burn has a pretty favorable matchup against most of the popular decks in the format. Almost every 3 color deck is a walk in the park due to the pain from the mana base. If and when a Scars styled fastland comes out for UR or BG combinations this may not be true. You can compete with non-interactive combo decks like Bloom, Storm, Ad Nausem, and Goryo’s Vengeance decks by relying on a quick clock and Eidolon of the Great Revel. Tron typically beats up on your worst matchups and often can’t mount any kind of defense before turn 3. The move toward Jace, Vryn’s Prodigy and away from heavy counter spell decks made Burn a great choice for this weekend. I didn’t play Wild Nacatl. While I think there is some place for “Cat Burn,” I don’t think this is a good time to be playing it. The fact that Nacatl doesn’t have haste and people are more likely to have an answer before it can attack means it is often a liability. The Searing Blazes over performed all weekend. There are not many decks that have no targets but when you are able to get landfall, it is a complete blowout. You are more likely to lose to decks that block your Goblin Guide than those that kill it. Also, unlike Draconic Roar, you can’t counter Searing Blaze by sacrificing the targeted creature. To be honest, some matches I didn’t sideboard any cards. I may have gone a little overboard on things I didn’t end up playing. Searing Bloods are great against the mirror, Elves, Affinity, Birds of Paradise decks, and are reasonable against infect. I wanted to make sure my good matchups stayed good and had some flexible cards for bad ones. Deflecting Palm is a card that I think is pretty underrated as a sideboard option. It’s pretty good against Emrakul, Griselbrand, Tarmogoyf, Wurmcoil Engine, and Eidolon of the Great Revel, and Valakut the Molten Pinnacle but you have to be in a pretty vulnerable position to use it. The downside is it’s miserable to draw more than one. Molten Rain on the play is good against some decks. I don’t bring them in on the draw as they tend to be too slow and difficult to cast. On the play it can punish a 3 color deck, Tron, or Amulet just long enough to get a win. Destructive Revelry was fine this weekend. 4 is probably too many but I didn’t draw any against Affinity. Smash to Smithereens is great against Tron and Affinity. It’s really just a 5th Destructive Revelry in those matchups. Path to Exile was great. I think 3 is just the right number. Drawing 2 feels miserable but drawing one is usually a blow out. It’s not as clean as Self-Inflicted Wound against Tarmogoyf but I like it’s flexibility more. I typically bring them in against anything Tarmogoyf decks, Twin, Tron (on the draw only), and any deck I suspect will play Kitchen Finks or Kor Firewalker. Kor Firewalker is only really good in the mirror. You aren’t guaranteed to draw one and there are many other axis you can fight the mirror on. My plan was to bring in Searing Blood and Deflecting Palm to keep their creatures off the board and counter their burn spells. Blood Moon is too hard to cast. It doesn’t really do anything unless you have a creature in play and then it’s only marginally impactful. Ancient Grudge may be a consideration next time. It doesn’t do any damage like Revelry or Smash to Smithereens but you’re also not just dead to a Spell Pierce. Rending Volley is just worse than Path to Exile most of the time. There’s no reason to play this. Round 1: Bye on Nothing – It was a tough battle but I managed to pull out a 2-0 win. He shamefully dropped after the round. Round 2: Luke Bartosik on R/G Tron – This is a great way to start a tournament. I won the die roll and proceeded to ruin his morning by attacking before his first turn with Goblin Guide. His natural turn 3 Tron had no Wurmcoil Engine so the game ended shortly there after. Game 2 he made a mistake of cracking his Expedition map using the colorless from both of his Grove of the Burnwillows. This gave me an opportunity to seal the deal without fear of a Nature’s Claim. Round 3: Roman Fusco on Jund: This was another great matchup for me. An early creature followed by a flurry of burn spells ended game 1. Game 2 I played an Eidolon after taking 6 damage from my lands by turn 2. I then proceeded to take 8 damage from my Eidolon while my opponent cast a bunch of 4-6 mana spells. The final Boros Charm put me to 3. Round 4: Matt Tumavitch on Affinity : This matchup is miserable if they draw a Cranial Plating or a Vault Skirge. This matchup is usually unwinnable if they draw both. Vault Skirge dispatched me quickly. Round 5: Ben Rasmussen on Jund: Okay back to Tarmogoyf and friends. Game 1 went better than excepted as he got stuck on 1 land and Goblin Guide showed him his future of no additional lands. Game 2 was rather close, I suspended two rift bolts with him at 4, expecting to win short of a Thragtusk. After he -2 Liliana of the Veil targeting himself (sacrificing Kitchen Finks) and played Huntmaster I had to draw another spell to win the game. Luckily, my deck is ~ 50% spells that do damage to my opponent. 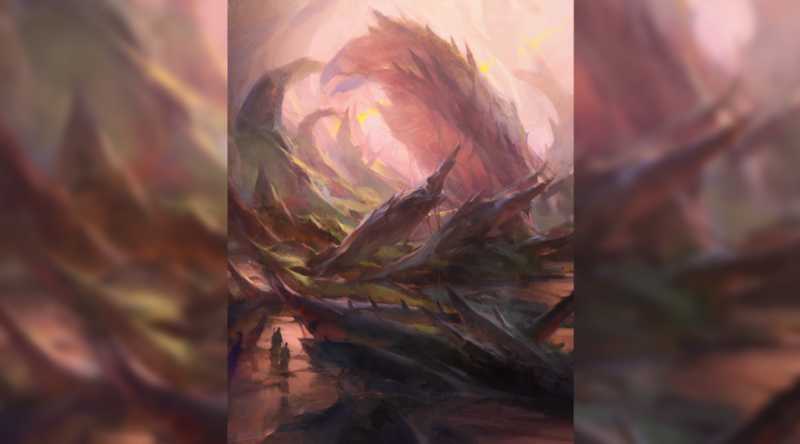 Round 6: Eric Feltner on Temur Twin: Three color mana bases are great for me. He won the die roll but lead by fetchling a Steam Vents with a Scalding Tarn to play Grim Lavamancer, essentially saving me a whole spell. Blind Fetch / Shock is one of the easiest ways for Burn to get ahead even if they’re on the draw. Game 2 he played a Scavenging Ooze and that is actually way more terrifying than Tarmogoyf in most situations. I was lucky to dispatch is quickly with a Searing Blaze and picked up another win. Round 7: Eric Blanchet on UR Twin: This is the point in the article where I had to go back and write last names because I had two opponents in a row named Eric playing twin. This match went to three games as Burn really has no ability to play around the combo. The crucial turn in the last game was me deciding if I should suspend my Rift Bolt or leave my Sacred Foundry untapped to represent a removal spell. Ultimately I couldn’t beat a counter spell and a twin and if he just had a counter spell then not suspending the Rift Bolt just makes my next turn worse. I dodged the untap, twin and won on the back of overloading their counter magic with sorcery speed burn. Round 8: Aryeh Wiznitzer on R/G Tron: The greatest hits keep on coming and after keeping a really awkward hand with only a Lavamancer as my only creature I take a quick game 1. After game 1 we got deck checked and Aryeh, a competitor from the top 8 of Atlanta last weekend, lamented on his loss last round to Burn. After we got our decks back and he mulliganed to 5, I was a favorite to take the match in record time. My turn 1 Goblin Guide into turn 2 Smash to Smithereens on his Spellskite would have been hard to beat on 7. After another good matchup, I am locked up to play tomorrow. Round 9: Stephen Berrios on Grixis Twin: I had not played this matchup yet but got slowly killed game 1 after keeping a 1 land hand and having it tapped multiple turns in a row by Pestermite and Deceiver Exarch. Before the end of the game he played a Thought Scour on himself and put 2 Splinter Twin into his graveyard. “Score one for the good guys,” I chided. We had a short discussion on whether Twin or Burn was the good guy. Game 2 I won with a turn 1 Goblin Guide into a turn 2 Eidolon of the Great Revel. He declined to Terminate it on his main phase so when I attacked I was able to Boros Charm to keep it alive. The damage is a wash (since the Eidolon gets in for another 2 and then deals 2 more on the next removal spell) unless he draws a big blocker or doesn’t play more 3 or less mana spells. I ended up ahead in that exchange as his next turn was Snapcaster Mage + Lightning Bolt to kill the Eidolon. Game 3 was another haste creature followed by a flurry of spells. Jace, Vryn’s Prodigy makes these decks more likely to play removal than counter spells and makes it extremely difficult to interact with Burn. At the end of the first day I did better than expected. A number of good matchups came my way and I only had to play against Affinity once. I ran through the rain to the nearest sit down restaurant and stuffed my face before going to sleep. Round 10: Richard Roberts on Jeskai Kiki-Twin? : I was pretty confused by his deck game 1 because he played a turn 1 Grim Lavamancer off of a fetchland and a shockland. He didn’t draw any particularly relevant threats and played a Valorous Stance on his Grim Lavamancer when I went to Searing Blaze it. I figure his deck doesn’t actually play counter magic and take game 1. Game 2 I missed an opportunity to kill him when he played a Village Bell-Ringer with only red mana untapped. Luckily he played a Restoration Angel the next turn and I was able to fire off 3 instant speed burn spells to kill him from 8. Round 11: Christopher Harabas on UR Twin: I don’t have good notes on this match but it seems like Goblin Guide revealed multiple Splinter Twins which is never good for them. Life pad says he probably died because he fetched at 5. Sorry if you’re reading this Chris! Round 12: Robert Cucunato on Affinity: Wheels gotta fall off somewhere, right? This match took 5 turns after I conceded to the unstoppable Vault Skirge with Cranial Plating. The upside was I was able to use the other 40 minutes of this round to grab food and use the restroom. It’s great to be playing burn, right? Round 13: Adam Schop on Jund: This was another typical play all my spells and win the game sorta deal. I took a minute to decided if I should cast spells on my turn or not and Adam encouraged me to play faster. I’m not sure how to take that since the matchup took 20 minutes total but whatever. Round 14: Charles League on Abzan Company: Well if you thought Vault Skirge was bad, I won game 1 after my opponent played 3 Kitchen Finks! I wasn’t sure if I was in Top 8 contention but I was feeling reasonably good after dispatching someone that gained 12 life that game. Games 2 I almost lost immediately as he played a Kor Firewalker on turn 2 but a timely Path to Exile dispatched it. I ended up unable to assemble the exact amount of burn required to kill him before he had infinite life. Game 3 I kept a 1 land hand on the play with multiple 1 mana spells. Unfortunately I was unable to draw a second land for many turns and put enough pressure to kill him before he gained infinite life. Unfortunately decks that “gain infinite life” are a bad matchup. Round 15: Matthew Rayes on Grixis Control: Game 1 was one of the longest I had played all weekend. We were both at 1 after I Searing Blazed his lethal Snapcaster Mage but his follow up Tasigur was better than the fetchland I drew. Game 2 I got off to an early lead with a Goblin Guide followed by a Grim Lavamancer. Overloading his removal early allowed both creatures to sneak in some damage and the remaining burn spells put the game away. Game 3 I played a turn 1 Goblin Guide and his “removal spell” of choice was a Snapcaster Mage doing it’s best Ambush Viper impression. Unfortunately for him I had the Searing Blaze that was greeted by a audible look of disbelief as he fell to 12 on my 2nd turn of the game. A few Lava Spikes later and I was packing my cards up getting ready to get on the plane. Modern is a fine format. It definitely has some rock – paper – scissors type matchups which are unfortunate. Luck has a lot to do with how often you will win or lose in large tournaments. That being said, Lava Spike is pretty much the best spell in the deck. It’s awkward in the fact that it’s a sorcery and only costs 1 mana so it’s very difficult to counter. It also can’t be redirected to a Spellskite. I think this deck benefits a lot from the Vancouver Mulligan rule as I was able to frequently send back 4 land 3 spell hands and keep 3 land 3 spell hands. I would recommend it to anyone looking to make a jump into Modern as it’s relatively inexpensive and extremely powerful. Great write up! 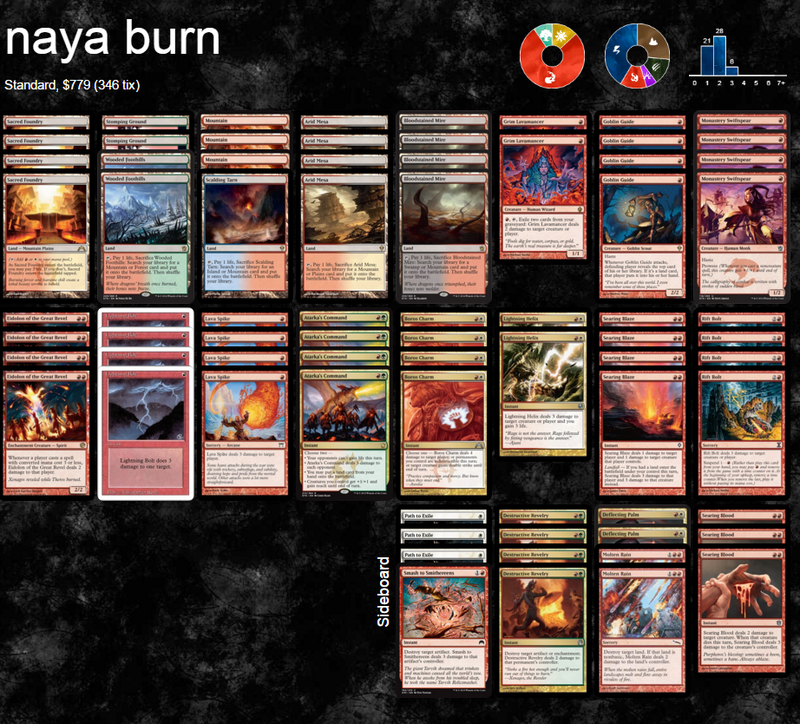 I’m now really excited to play my Naya Burn list. Great article. Really liked the sb explanation.